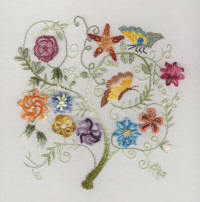 Welcome to the world of Brazilian Dimensional Embroidery! JDR Brazilian Elegance specializes in ALL things related to Brazilian Embroidery but provides a whole lot more for all stitchers. 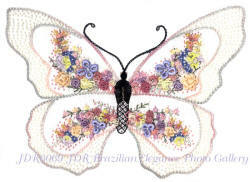 JDR-BE provides Brazilian Dimensional Embroidery Designs Learning Kits, Sampler Blocks, Sunshine's Treasures Embroidered Quilt Blocks, Hearts and Flowers Blocks, EdMar Thread, books and stitching related supplies needed for all your Embroidery projects. Brazilian Embroidery is a wonderful 3 dimensional stitchery technique that can be used alone to create wonderful pictures, pillows, linens, wearable art, personal accessories and what ever else your needle can stitch through. 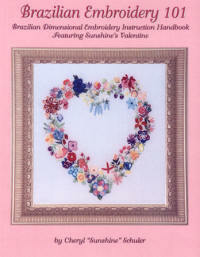 Other stitching projects can be "spruced up" with the addition of some 3 dimensional flowers. Quilts can be embellished with the wonderful Brazilian stitches. Absolutely beautiful floral sprays can be added to clothing and you won't have to worry about the fibers withstanding the frequent washing. "Brazilian threads" are 100% rayon Z-twist threads that endures a lifetime of laundering on clothing. 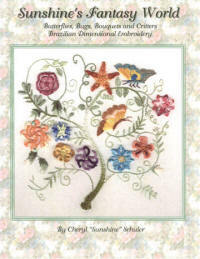 JDR specializes in Brazilian Embroidery , but this raised embroidery can be incorporated into your Stumpwork Embroidery , Hardanger, Silk Ribbon Embroidery, Quilting, Craft Projects, Clothing Embellishments and Other Stitching techniques. Brazilian Embroidery is hand stitchery done predominantly with dimensional stitches using the "Z" twisted rayon threads; with the original fine growth & Field Flowers encouraged." 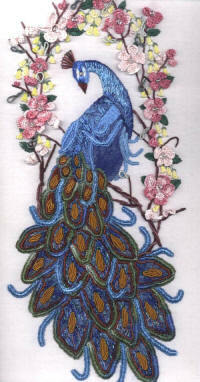 We also provide the EdMar threads, embroidery designs & kits by many leading designers , all types of embroidery books, a sparkle of Kreinik, an added dimension of Art Silk thread, YLI Silk Ribbon, beads & supplies. 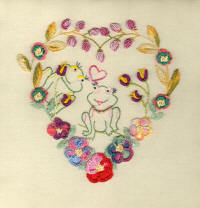 "Other" types of embroideries are incorporating Brazilian Embroidery into their art, so we will continue to expand. Browse around via the buttons and links or go to the Table of Contents - Site Map page for a complete listing. There is currently 1500 pages to this web site. JDR 309 New Design package! We have over a 1900 Embroidery patterns & kits to stitch, notions, every EdMar Thread and Rajmahal Art Silk available, beads, metallic threads and books for the embroiderer and stitchers of all kinds. If you live close to the studio-give me a call and I will make sure that I am available to help you. If you live out of the area we are providing this online store to suit your needs. Mail order requests are welcome. You can place your order via the online shopping cart, telephone, email or fax or go to the "order form" page and print it out and mail or fax your order to us. If you plan to send in an order - go to the order form in this site and print it out and use that to write down your items as you go through the site. 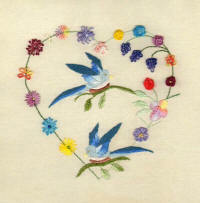 Specializing in Brazilian Dimensional Embroidery but providing stitchers with much more!